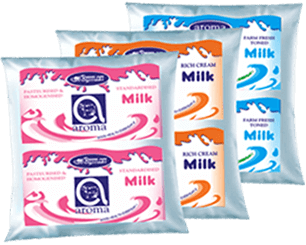 Aroma the most trusted name in thousands of households in Coimbatore District, is the first choice of many housewives for its quality milk and dairy products. Supplying fresh dairy milk has been the core focus of Aroma since its inception in the year 1972. Started in a small way by Shri. Ponnuswamy, founder and Managing Director, today Aroma boasts of a host of full fledged dairy and bakery outlets across the city, and its suburbs. Aroma in Limca book of records. An inter school national level literary meet conducted by elite circle along with other organizations including Aroma on August 12, 2006 at Codissia trade fair, Coimbatore in which 61,782 students from 12 states participated created a world record.